The bag, within a bag, which contained the wings. A small promo box would have been nicer. Last week I was flying back from Seoul to Singapore, on Thai Airways. When I booked these tickets in January, I had the option of taking the non-stop flight from Seoul to Bangkok, which would allow me to connect to Singapore and arrive at 7pm, or another option was taking the Seoul-Hong Kong-Bangkok flight which barring any delays, would allow me to quickly grab McDonald's at HKG. Adding this stop in Hong Kong meant that I would miss the early flight to Singapore, so I would arrive at 10:45pm, not that it made any difference for me, as my wife was still back in Seoul. Also, it's worth to mention that there aren't any airport taxes if you arrive and depart Hong Kong in the same calendar day, so it didn't cost me anything extra to make this stop. What made this risky is that it's not a typical connection, but a technical stop, so you fly out on the exact same plan you fly in on to Bangkok. I also knew, since I've flown TG quite a bit from HKG, is that they use the farthest possible wing from the only McDonald's in HKG, so I had to plan this stop very well. 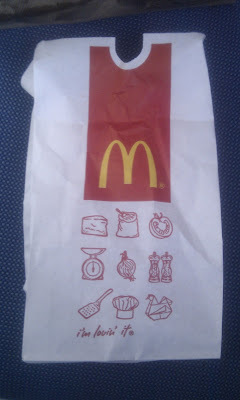 When I arrived in HKG, it figures that our plane had a gate at the absolute FURTHEST gate from the McDonald's. If you think of HKG as a human body, with legs spead and arms wide open, we were at a gate in the left foot, (far left in the photo above) and the McDonald's is the floor above the head (the large cluster of orange on the right side of the photo). There was a transit security checkpoint in the 'crotch' of HKG, but I knew if I used that one, I would have to walk all the way down the 'body' to reach McDonald's. I knew that if I hopped on the train towards immigration and baggage claim, that I would be spit out at the head, and I could use the transit security checkpoint there, cutting 10 minutes of walking off my already short time. Luckily I did this, as the McDonald's had a 10 minute queue to order my food, so if I walked all the way there, I probably wouldn't have been able to wait, as my stop only gave me 30 or so minutes on the ground in HKG. Once I ordered my food, it took longer than I would have liked to get it. I was on the look out for an open table but most seemed to be full, so I asked them for take away. I saw that my flight was still not boarding, so I thought that I could at least get over to the gate, and eat my food there whilst the rest of the passengers boarded. Thai Airways only needs you to be on the plane 10-15 minutes before departure anyway. I made the long hike back over to the gate with my food in hand and though the flight was calling for boarding, there was a long, 100+ passenger queue waiting to get on the flight. This was perfect for me as I never wanted to eat the food on the plane, and it allowed me to have 'most' of my food whilst waiting for everyone else was boarding, I say most, because something happened which made me stop eating immediately and rush to find airport staff, but I'll get to that in the next review. What I didn't mention was that I was able to get 3 new item's to review during this stop in HKG. I'm only reviewing the Pickled Chili McWings now as they were the first item I tried, and I'll do them in order to explain the situation nearly preventing me from reviewing one of the items. To be honest, I had completely forgotten about the Pickled Chili McWings. 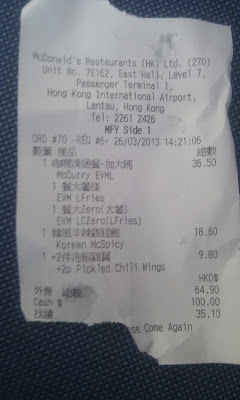 When I checked the McDonald's Hong Kong website prior to arriving, I did see the McWings promo as it was apart of their new "Spicy Sensations" line of items, but I was more interested in the burgers, but when I arrived at the branch they had the little promo posters above the register, which reminded me to give them a try. When I look at the receipt, I see that it was $9.80HKD to add to the combo, but their website said it's only $9.50. Seems to me all of the prices on my receipt are more than the website, so that must be the 'airport surcharge'. Seems a little misleading since there are posters all over HKG saying that the shopping is the same price as 'downtown'. But the $0.30HK (5 US cents) increase isn't bad compared to some airports which charge you double the city price. When I finally opened them up, I was surprised to see that they were noticeably bigger than the recent Honey Lemon Drumlets that I had back in Singapore a month ago, and they were cheaper too! I was disappointed that they didn't have any promo packaging for these, and the bag they served them in was far too big for 2 pieces of chicken, a complete waste of paper. When I gave them a smell, it didn't smell like any pickled chilli that I have ever had, and the skin had a very sticky feel to it. I had one drumstick, and one wing, and both had decent amount of meat on them. 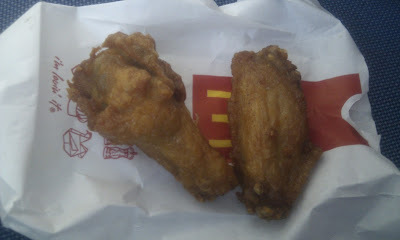 As I said in the Honey Lemon Drumlet review, I'm not a fan of fried chicken, but the flavouring they added to these McWings was quite nice. I can't say that I imagined picked chilli whenever I took a bite, but whatever the flavour was supposed to be, I enjoyed it. Though I love spicy food, I actually shy away from having picked peppers in my food, as I can't taste the necessary spiciness and I find the acidity in the vinegar to be too overpowering. I think what McDonald's was going for wasn't supposed to be a 'fresh' pickled pepper taste, but rather a dried chilli pickled pepper, and whatever it was pickled with, was more sour than acidic. As I said before, they were larger than the Honey Lemon Drumlets, but each piece only had 2 or so bites worth of meat, but I think McDonald's trying to sell 4 pieces as a stand alone meal is a bit of a stretch. You are better off going for a cheaper meal, and adding these on. If you are in Hong Kong over the next few weeks, definitely give these a try whilst you can, add them on to a combo, don't buy them as a meal.